Find and compare the best prices from a range of well known car rental companies at Split Airport. This is a free to use facility, enabeling you to book direct with the company quoting the price. 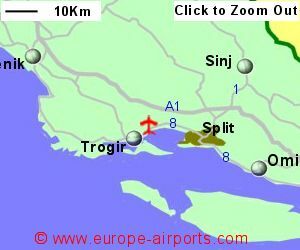 Split Airport, otherwise known as Airport, is located 25Km West of Split, Croatias second largest city, on the Adriatic west coast of Croatia with ferries connecting to the nearby Adriatic islands of Hvar, Brac, Vis, Lastovo. 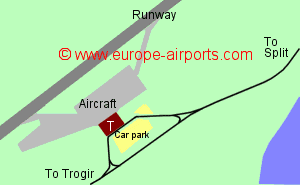 The airport at Split is located adjacent to the main coastal road giving good access to the city and its ferry harbour. An expansion of the terminal building was started in 2017 and due to be completed in 2019. 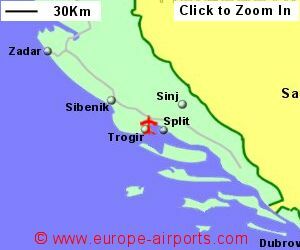 There is a bus service to the city of Split approximately 7 times per day at a cost of 30 - 40 Kuna (approximately 4 - 5 Pounds). Taxis are available and taxi boats connect to surrounding islands. The airport has a restaurant and coffee bar, banking and currency exchange facilities, shops, mini market, duty free, VIP room and a post office. Split airport handled 2.8 million passengers in 2017, an increase of 23% compared to the previous year, and keeping Split as the second busiest airport in Croatia, just beating Dubrovnik.